Mazda's turbo-diesel CX-5 in Maxx trim. ONE of the advantages of motoring advancements in the past five years is that access to the latest technology doesn't have to cost the earth. Take the Mazda CX-5 for example, the poster child for the manufacturer's ground breaking SkyActiv features encompassing the engine, transmission and chassis which maximises performance and minimises fuel consumption. Part of the system is the stop-start function which is designed to aid frugality. It may not be as effortless as those in luxury vehicles but the delay is minimal and power readily available. The Mazda CX-5 may look smaller than the CX-7 it replaces but does in fact have more room for the driver and passengers alike. Seats are fairly supportive and comfortable although the rear pew has a shorter squab than is ideal. Head room for back seat passengers is good but legroom, especially for tall adults, is quite dependent on the generosity of those seated in front. The leather-covered steering is nicely chunky to the touch and adjustable for both height and reach. The interior is fashioned in quality materials with Mazda keeping those jarring cheap plastics to a minimum. Instrumentation is well set out and more simple than you would bargain for only really coming to life when illuminated for night-time driving. At 403 litres the boot is more than average for this class expanding to a handy 1560 litres with the back seat folded flat. The Mazda CX-5 is nothing if not smooth. There is no hesitation in take off, certainly none along challenging inclines and the brakes when called into action complete the task in an efficient manner. The CX-5 was conceived as a sportier drive and the chassis and suspension calibration is a reflection of that. It is compliant on good roads and composed on irregular ones but still retains enough grip around corners. Handling is nicely responsive and although it can sometimes feel a bit top heavy understeer is minimal. When we drove the petrol at the beginning of the year we found it sometimes needed a little cajoling but this diesel engine with a class-leading 420Nm of torque is a rather capable machine. This SUV is an easy, enjoyable ride whether you're negotiating early-morning traffic or stretching its legs down and open highway. It would be difficult to be disappointed with a spec sheet in our Maxx Sport test car that included 17-inch alloys, dual zone climate control, keyless entry with push button start, six-speaker sound system with USB input and Bluetooth connectivity with audio streaming, a fully integrated reverse camera and sat nav system as well as automatic headlights and wipers. Safety inclusions are top draw too with six airbags, electronic stability control, anti-lock brakes, traction control, emergency brake assist with EBD and hill-start assist as standard. Hasn't Mazda done well in creating an engine that is both frugal and powerful? Official figures for the diesel are listed at 5.7litres/100km and although we ran closer to 6.1 litres/100km for the week that is still quite a scrooge-like performance for a SUV. Peace of mind comes from a three-year unlimited kilometres warranty. Insurance costs are middle of the range and service intervals at 10,000km or every six months. The petrol version of the CX-5 has been making inroads on a strong competition line-up featuring the VW Tiguan ($42,990), Subaru Forester ($45,490), Kia Sportage ($39,720), Nissan X-Trail ($45,240) and Skoda Yeti ($37,990) and there is little doubt the diesel will just emphasise that presence. 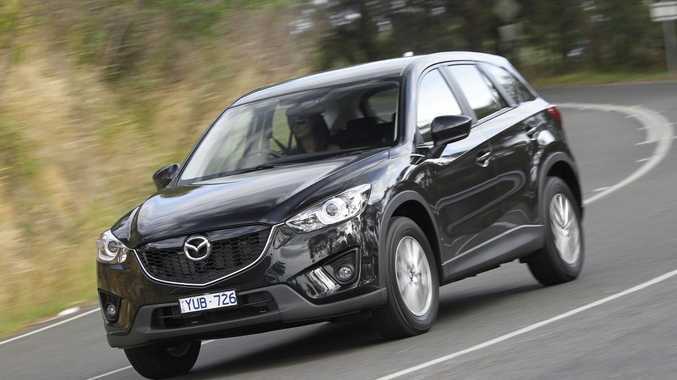 The Mazda CX-5's easy entry and exit points as well as a boot which presents with a flat lip enhances its everyday appeal to young families and time-poor parents. Excellent driving dynamics allows you to enjoy the journey even when engaged in mundane tasks. The driver's high seat position combines with the large windscreen for good forward visibility although the large D-pillar over the right shoulder does create a small blind spot. Handy storage pockets are plentiful with a nifty pull-down compartment separating the two passengers in the back. There may be a few complaints as the weather heats up however, with air vents lacking in the rear. The CX-5 embraces Mazda's Kodo design philosophy which looks to incorporate the power and beauty of an animal in full flight into elegant lines and graceful details. A prominent stance and high wheel arches add to the athletic look while the upright grille and large side mirrors improve the SUVs aerodynamics. It is certainly more arresting than some of its rivals. Mazda has a much more dynamic proposition in the CX-5 than they did in the CX-7. It is sleek, well proportioned, has worthy driving dynamics and is kind on the back pocket. The diesel, which now is offered only in auto, just has that extra oomph to carry it clear across the line. This will be a good reveal for Mazda with consumers already warming to its appeal in big volumes. The good stuff: The CX5's space and good inclusions list impressed. What we'd like to see: More power in the petrol which need a bit of coaching when hard work was required. Warranty: Mazda offers a three-year unlimited kilometre warranty. Model: Mazda CX-5 Maxx Sport. Details: Five-door all-wheel drive sports utility vehicle. Engine: 2.2-litre in-line DOHC intercooled turbo-diesel generating maximum power of 129kW @ 4500rpm and peak torque of 420Nm @ 2000rpm.